Old 52 recently sent us a variety of sodas to review. It’d be an understatement to say that these are untraditional flavors. In fact many of the flavors, brands, and ingredients I’ll be reviewing for them are downright bizarre. So it looks like that Old 52 knows The Soda Jerks and the Carbo-Nation pretty well. With that said, it’s time to raise our bottles and drink a S’more! That’s right I said, nay typed, S’more. Rocket Fizz S’mores sits on my desk today. The label consists of a man flying around the earth whilest sitting on a rocket. This is all done in a retro style, but at the same time looks like a 10 year old drew it… I’d wear it. I notice right away that Rocket Fizz S’mores is made with pure cane sugar, so we’re off on the right foot… um bottle… something. The rest of the ingredients are fairly average so it’ll be interesting to see how they capture graham cracker, chocolate, and marshmallow with them. Time for the opening! The scent coming out of the mouth of the bottle is a graham cracker/coffee combination. I think I can smell a hint of burnt marshmallow (which is fine since it’d be over a fire anyway), but I’m unable to smell any discernible chocolate aroma. At this point two of the three key ingredients are in attendance at the smell portion; hopefully the ever important chocolate will make his appearance shortly. It’d be rather awkward to put chocolate on the side of a milk carton in hopes of finding him. I think people would get confused. Within the first sip you taste the missing chocolate, a small amount of coffee, graham cracker, and the hintiest of marshmallow. Each sip following the first only builds on the foundation initially laid. The chocolate starts to overpower the coffee taste, the graham cracker really steps up in flavor, but the marshmallow still sits quietly in the back hoping not to get noticed. 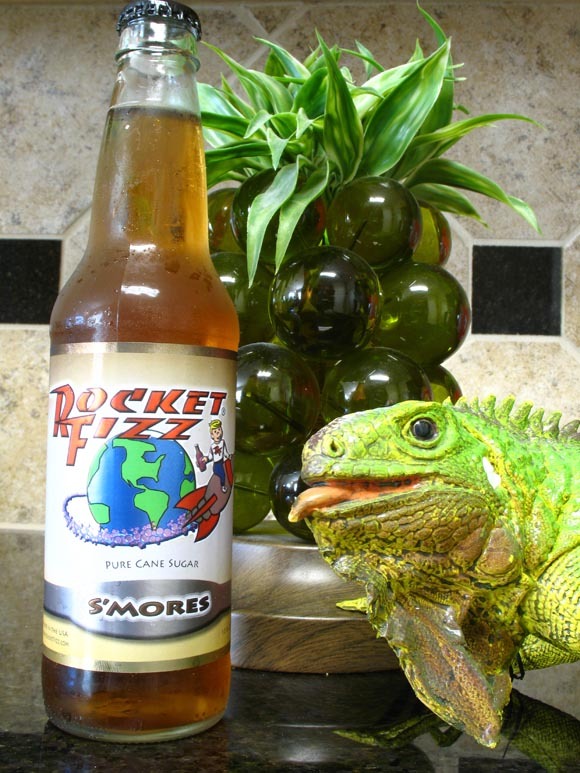 Carbonation level is not a problem in Rocket Fizz S’mores, and it shouldn’t be with the name Rocket FIZZ. Oh can you imagine the rant I’d have gone on if Rocket Fizz soda had little fizz. Consider yourself lucky Rocket Fizz, or just be thankful that your creators took that into account. Onward. The aftertaste of Rocket Fizz S’mores trades between a mocha coffee and a cream soda. It’s a very dirty aftertaste in the fact that grabs hold of the inside of your mouth and doesn’t let go. I’ll be honest with you, and why wouldn’t I be as I don’t get paid to lie… or tell the truth… or at all. Rocket Fizz S’mores has surprised me greatly. I went into this thinking I was going to be drinking a novelty soda, a one-time buy. I could see myself drinking this again… happily. Sure, improvements could be made. They could increase the chocolate flavoring just a smidge, and the marshmallow should be brought up to match. With that said, Rocket Fizz S’mores has made me excited to try more of these oddly flavored drinks. I don’t have a closing sentence to wrap this all up with, so I wrote this one instead. Scared of fire but love S’mores? Purchase Rocket Fizz S’mores here at Old52.com.